If I am the only one doing the graphics/charting stuff (so I think I'm the only one that needs a license) but I'm working with other developers on a larger project, is there a way that I can set it up so at least they can still build (same problem with, for example, a 'nightly build' machine) even if they don't have/need the design time support bits installed? Or does every person that might ever need to build need to purchase a separate copy of TeeChart (in this case, it's a question about the .NET version for VS2008). What are the expected limitations and work-arounds for machines where this is not installed? For build-only of TeeChart in a groupwork environment no additonal license is required for the build-only machines provided, of course, that no modifications either direct or indirect (wrapped), are made to TeeChart characteristics. A physical designtime license must exist in machines that build assemblies that contain TeeChart. The license installer utility is available on the customer download page. So it sounds like you can't have a bld machine sans license? Most places I've been to (and here) normally check in only third party libraries and source code, we don't check in pre-built or built local assemblies. So in that case, since the build machine (or other developers) would have to build the assemblies that contain teechart pieces, even if they do no design time modifications, would need a design time license it appears. 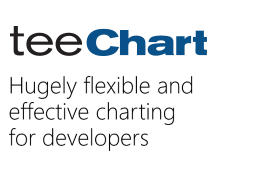 In a groupwork environment non-TeeChart Developer licensed machines may build assemblies that access TeeChart provided none of the code relating to TeeChart features is modified at that machine, otherwise a TeeChart Developer license should be purchased for it. To permit the physical build at that machine Steema make a machine-license installer utility available on the TeeChart for .NET Customer download page.